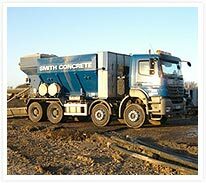 SMITH concrete is supplied throughout Milton Keynes, Buckinghamshire, Bedfordshire and surrounding areas and will suit almost any application, large or small. Alternatively, complete our enquiry form on our contacts page which can be found here. 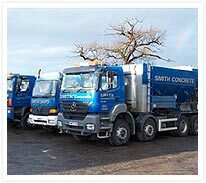 If you are from the Milton Keynes, Buckinghamshire, Bedford & Northants area choose Smith Concrete for the best way to get your concrete delivered. Our Volumetric Concrete Mixer has the unique ability to pour the correct amount on site required for your job, no disposal costs, no mess and fast delivery. Our customers are already assured of a professional service from Smith Construction: a recognised local brand and reliable delivery of a high quality product. We benefit from materials supplied by our own local, aggregate recycling facility (Visit our Recycled Aggregates Page) : as for all the services provided by the Group utilising our own facilities and products KEEPS COSTS LOW for our customers and using a local supplier means your order gets to your site. Looking for a competitive quotation? Not sure what you need for your job? Call us now on (01525) 261406 for friendly advice and to discuss your requirements. All we need is some sizes and basic information about your site and we can provide a quote based on the amount and type of mix you need. We'll tell you how much, what it will cost, and when we can deliver it. We can also offer you information on earthworks. Remember, its mixed on site so you only pay for what you use.